Ever since I first watched Ina Garten make her white chocolate bark, I have wanted to try my hand at it. You can find her original recipe in her How Easy Is That? cookbook or online at the Food Network recipe site. Because Valentine’s Day is just around the corner, I made a few changes to Ina’s recipe to feature red and white colors. I splurged on a handful of Marcona almonds, my favorite, and added some cashews instead of the pistachios in Ina’s recipe. Dried cherries replaced her dried apricots, but I kept the dried cranberries. I had really wanted to throw in some dried strawberries but couldn’t find them anywhere. I kept to Ina’s technique, except for toasting the nuts in a skillet instead of, as she suggests, the oven. Marcona almonds toast really quickly and I wanted to keep a close eye on them. As careful as I am about using salt in my cooking and baking, you need to use salted nuts here to contrast with the sweet chocolate and tart dried fruit. Splurge on the best white chocolate you can afford – I used Valrhona – expensive, but your Valentine deserves the best, right? TIP: Don’t use white chocolate chips, tempting as it is, because they contain stabilizers and won’t melt properly. They don’t taste very good, either. 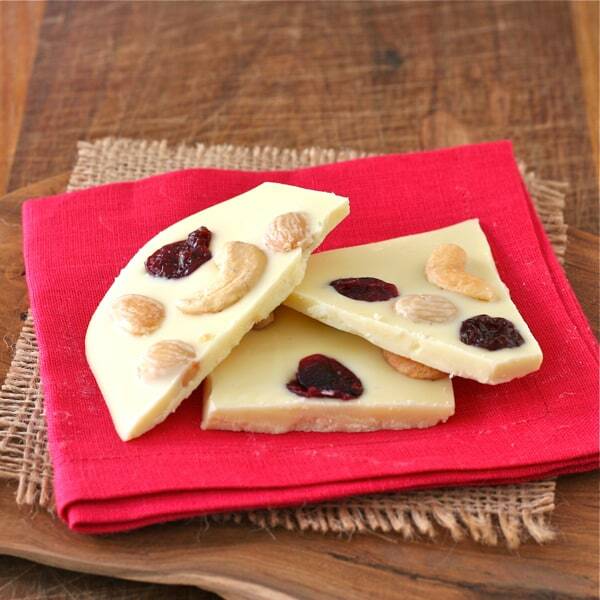 White chocolate bark studded with salted nuts and tart dried berries. Place the nuts in a skillet over medium-low heat, just until lightly toasted. Set aside to cool. Place a piece of parchment paper in a sheet pan and use a pencil to measure out an 8 X 10 rectangle. Turn the paper over to avoid getting pencil marks into the chocolate. Place ¾ of the chocolate into a heat-proof glass bowl. Heat the chocolate in a microwave at 30 second intervals, stirring in between, until just melted. Add the rest of the chocolate and stir until melted. Pour the melted chocolate into the rectangle and gently smooth to fill the space. Add the nuts and fruit, sprinkling evenly over the chocolate, and use the back of a spoon to press into the chocolate. Chill for 1 hour in the fridge before breaking into large pieces. Yum! This sounds delicious, what a treat! I saw that episode when she made the bark and it looked so good I had to make it myself. I think your bark looks spectacular!! I made a mistake any only bought half the amount of costly white chocolate Iva prescribed. Larry ate all of it! Mmm, white chocolate bark is so good and so easy to make. I like that you decorated it in Valentine’s colors, too. Yes, it is easy to make – I don’t know why I waited so long! Ah, so that’s my problem. I have only eaten which chocolate chips, and I thought they were vile. So I steer clear of white chocolate. I must try better quality! I agree, Dorothy, “vile” is the words for white chocolate chips. I bought my chocolate at Whole Foods – expensive. Larry gobbled up his early Valentine in record time. Oh, I love bark – especially homemade bark. And dried cherries? Double yum! Thanks, Laura – a little too good…just after it took me a month to lose my holiday pounds. Ooooh I love white chocolate. What lovely flavors getting all lovey dovey here! Thanks, Kimberly – eager to catch up on your site. Good that you say to avoid white chocolate chips. The good stuff, like Valrhona, has cocoa butter, which is what makes it taste so rich and creamy. Lucky Larry, that’s what I’m going to call him. I think I spent $16 on that expensive chocolate, Dianne – but it was worth it. Hope you are recovering well Liz. This is a great idea for a homemade Valentine’s treat and I love the substitutions you made. Your bark looks like a work of art, it also sounds really delicious. I remember seeing Ina make that bark and always thought I would like to try it. Love your version for Valentines Day. Wishing you a speedy recovery from the hand surgery. Hope it’s successful and you have full use of your hand. I love your homemade candy recipes and this one sounds amazing. I hope you’re healing well. Miss you! This one is easy and very French – healing OK and miss you too. Aloha!